The Lenovo System x3250 M5 single-socket 1U rack server is designed for small businesses and first-time server buyers looking for a solution to improve business efficiency. It delivers several innovative features in a compact 1U form factor with a competitive price. This product guide provides essential pre-sales information to understand the x3250 M5 offerings, its key features and specifications, components and options, and configuration guidelines. This guide is intended for technical specialists, sales specialists, sales engineers, IT architects, and other IT professionals who want to learn more about the x3250 M5 server and consider its use in IT solutions. Withdrawn from marketing: The x3250 M5 now withdrawn from marketing. The replacement system is the x3250 M6 which is described in https://lenovopress.com/LP0096. The Lenovo System x3250 M5 single-socket 1U rack server is designed for small businesses and first-time server buyers looking for a solution to improve business efficiency. It delivers several innovative features in a compact 1U form factor with a competitive price. The System x3250 M5 provides next-generation performance in an innovative and compact design with flexible configuration options, built-in security, and systems management capabilities. It leverages the next-generation quad-core Intel Xeon processor E3-1200 v3 product family technology. The following figure shows the System x3250 M5 server. The x3250 M5 includes features not typically seen in this class of system, such as standard RAID-0, 1, and 10 with the ServeRAID C100 for simple-swap SATA models, remote control capabilities even when the machine is powered off, and basic light path diagnostics on processor, memory, and hard drives. This flexible 1U rack-mountable server is also highly upgradable and expandable, scaling from low-cost, fixed-function models to feature-rich, highly available models. The System x3250 M5 server is a compact, cost-effective, single-processor 1U rack server that has been optimized to provide outstanding availability, manageability, and performance features to small-to-medium-sized businesses, retail stores, or distributed enterprises. ECC memory provides error correction not available in PC-class "servers" that use parity memory. Avoiding system crashes (and data loss) due to soft memory errors can mean greater system uptime. Solid-state drives (SSDs) offer significantly better reliability than traditional HDDs for greater uptime. The optional thermal enhancement option kit allows the use of x3250 M5 servers in environments with temperature limits extended to 40 degrees C. It also helps lower fan speeds depending on the environment's temperature to lower acoustic noise and energy use. one Intel Pentium processor G3200/G3400 product families with two cores up to 3.4 GHz, 3 MB L3 cache, and up to 1600 MHz memory speed. Memory Four dual inline memory module (DIMM) sockets. Support for UDIMMs. DIMM speeds up to 1600 MHz. Memory maximums Up to 32 GB with 4x 8 GB UDIMMs. Disk drive bays Up to eight 2.5-inch hot-swap SAS/SATA drive bays, up to eight 2.5-inch simple-swap drive bays, up to four 3.5-inch hot-swap SAS/SATA drive bays, or up to four 3.5-inch SATA simple-swap drive bays. Maximum internal storage Up to 7.2 TB with 900 GB 2.5-inch SAS HDDs, up to 8 TB with 1 TB 2.5-inch NL SAS/SATA HDDs, up to 12.8 TB with 1.6 TB 2.5-inch SATA SSDs, or up to 24 TB with 6 TB 3.5-inch NL SAS/SATA HDDs. Intermix of SAS/SATA is supported. RAID support RAID 0, 1, and 10 with the C100. RAID 0, 1, and 10 with the H1110, M1115, or optional M5110. Optional upgrade to RAID 5 is available for the C100. Optional upgrade to RAID 5 and 50 is available for the M1115. Optical drive bays One, for models with 2.5" drives. Support for optional DVD-ROM or Multiburner. Network interfaces Up to four integrated Gigabit Ethernet 1000BASE-T RJ-45 ports with the onboard BCM5719 controller (two ports are enabled, and additional two ports require the optional software FoD upgrade to enable them). Ports Two USB 3.0 ports on the front. Four USB 2.0 ports, one DB-15 video port, one DB-9 serial port, and four RJ-45 GbE network ports on the rear. One internal USB port (for embedded hypervisor). Cooling Calibrated Vectored Cooling with five redundant non-hot-swap system fans. Power supply Up to two redundant hot-swap 460 W AC power supplies (80 PLUS certification), or one fixed 300 W AC power supply (80 PLUS certification). Hot-swap parts Hard drives (model dependent) and power supplies (model dependent). Systems management UEFI, Integrated Management Module II (IMM2), Light path diagnostics with LEDs for DIMMs, processor, slots, fans, and power supplies. Automatic Server Restart, Lenovo XClarity Administrator, and ServerGuide. Optional IMM Advanced FoD Upgrade for remote presence (graphics, keyboard and mouse, virtual media). Security features Power-on password, administrator's password, and TPM. Limited warranty Three-year customer-replaceable unit (CRU) and on-site limited warranty with 9x5 next business day (NBD). * x in the Model number represents a country-specific letter (for example, the EMEA Model number is 5458A2G, and the US Model number is 5458A2U). Ask a Lenovo or business partner representative for specifics. † Processor detail: Processor quantity and model, core speed, L3 cache, memory speed, number of cores, TDP. The x3250 M5 server supports only one processor, which is already installed in all models. The following table lists all processors available in standard models of x3250 M5 or via CTO. If there is no corresponding where-used model for a particular processor, that processor is only available through the configure-to-order (CTO) process. Lenovo DDR3 memory is compatibility tested and tuned for optimal System x® performance and throughput. Lenovo memory specifications are integrated into the light path diagnostics panel for immediate system performance feedback and optimum system uptime. From a service and support standpoint, Lenovo memory automatically assumes the system warranty, and Lenovo provides service and support worldwide. The x3250 M5 server has four DIMM slots, and only DDR3 ECC UDIMMs are supported. The processor has two memory channels, and there are two DIMMs per channel. If more than one DIMM is planned to be installed, DIMMs must be installed in a pair, and both DIMMs in a pair must be identical in type and size. Intel Xeon processor E3-1200 v3 product family supports up to 1600 MHz memory speeds for one DIMM per channel and two DIMMs per channel configurations provided that the processors support this memory speed. The x3250 M5 server supports ECC memory protection. The following table lists the memory options that are available for the x3250 M5 server. Standard models ship with four 2.5-inch SFF SAS/SATA hot-swap, eight 2.5-inch SFF SAS/SATA hot-swap, four 3.5-inch SAS/SATA hot-swap, or four 3.5-inch SATA simple-swap drive bays. The following table shows the internal storage upgrade and expansion options available for the x3250 M5 server. Option 46W6577 upgrades models with four 2.5-inch SFF simple-swap drive bays and ServeRAID C100 to hardware RAID models with four or eight SFF simple-swap drive bays. In addition, a supported hardware RAID controller (H1110 for four drive bay models; M1115 or M5110 for four or eight drive bay models) or host bus adapter (HBA) (N2115) is required (not included in the upgrade, it must be purchased separately). Option 46W6576 upgrades models with four 3.5-inch LFF simple-swap drive bays and ServeRAID C100 to hardware RAID models. In addition, a supported hardware RAID controller (H1110, M1115, or M5110) or HBA (N2115) is required (not included in the upgrade, it must be purchased separately). Option 00KC525 upgrades models with four 2.5-inch hot-swap drive bays and H1110 controller to models with M1115 or M5110 RAID controller or N2115 HBA. M1115, M5110, or N2215 is not included in the upgrade, it must be purchased separately. Option 00AL348 upgrades models with four 2.5-inch SFF hot-swap drive bays and hardware RAID controller (M1115 or M5110) or HBA (N2115) to eight 2.5-inch SFF hot-swap drive bays. Eight drive bays support: Models with 300 W fixed power supply can only support up to four drive bays. 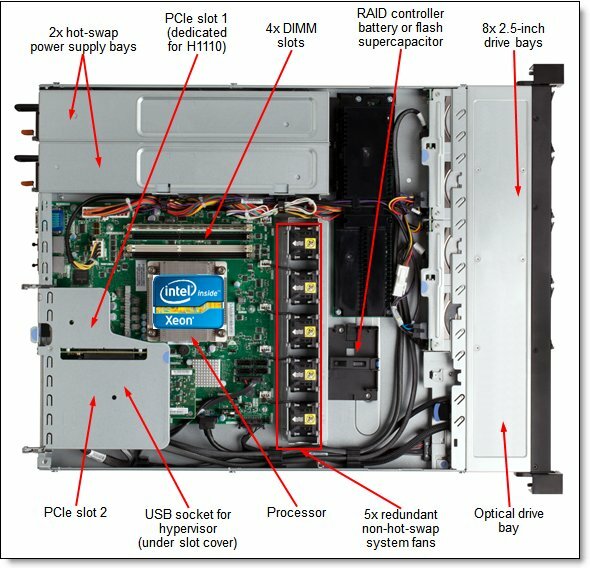 3.5-inch drive bay support: Models with 460 W redundant hot-swap power supplies do not support 3.5-inch drive bays. An optical drive can be installed internally in models with 2.5-inch hot-swap or simple-swap drive bays (no optical drive support in models with 3.5-inch drive bays). The following table lists the internal RAID controllers, HBAs, and the additional options that are used for the internal disk storage of the x3250 M5 server. For PCIe adapters, the table also indicates which slot the adapter is installed in. # The C100 is an onboard ServeRAID controller. † The ServeRAID M5100 Series RAID 6 Upgrade (81Y4546) requires RAID 5 Upgrade with caches (81Y4484, 81Y4487, or 81Y4559). The C100 is an onboard ServeRAID, and it does not consume a PCIe slot. The H1110 RAID adapter is supported in a dedicated PCIe slot (slot 1). All other hardware RAID adapters and HBAs are supported only in PCIe slot 2. The following table (Parts 1 and 2) lists drive types and internal drive bay configurations that are supported by the internal RAID controllers and HBAs (SAS HDDs include both SAS and near-line (NL) SAS HDDs, and SATA HDDs include both SATA and NL SATA HDDs). (Models with fixed power supply) Drive type 4x 2.5-in. (Models with hot-swap power supplies) Drive type 4x 2.5-in. The following table lists drive options for the internal storage of the x3250 M5 server. The x3250 M5 server does not support internal tape drive options or other internal backup units. However, it can be attached to the external tape drives by using USB, SAS, or Fibre Channel connectivity (see Table 24). The x3250 M5 server supports the optical drive options listed in the following table. Server models with 3.5-inch HDDs do not support an internal optical drive. The x3250 M5 supports up to four integrated Gigabit Ethernet 1000BASE-T RJ-45 ports (two enabled standard, and two enabled optionally with the FoD upgrade). One port (Ethernet port 1) is shared between the IMM2 and the operating system. The following table lists additional network adapters. * These adapters require SFP+ optical transceivers or DAC cables that must be purchased separately. See the following table. The following table lists SAS HBAs and RAID adapters supported by x3250 M5 server for use with external storage. * One M5100 Series FoD software license is required per server. The following table lists the Fibre Channel HBAs that are supported by the x3250 M5 server. The x3250 M5 server does not support High IOPS SSD adapters. The x3250 M5 server does not support graphics processing units (GPUs). The x3250 M5 server supports one 300 W AC fixed power supply or up to two redundant 460 W hot-swap power supplies. These power supplies are 80 PLUS certified. Standard models come either with one fixed or one hot-swap power supply (model dependent). The following table lists the power supplies. An AC hot-swap power supply option ships standard with one 2.8m, 10A/100-250V, C13 to IEC 320-C14 rack power cable. ** Fixed power supply comes either with standard or custom (special bid or CTO) models. The x3250 M5 server supports VMware ESXi installed on a USB memory key. The key is installed in a USB socket inside the server. The following table lists the virtualization options. For remote management, IMM2 uses Ethernet port 1. Ethernet port 1 is shared between the IMM2 and the operating system. The thermal option kit allows clients to use x3250 M5 servers in environments with the temperature limits extended to 40 degrees C. It also helps lower fan speeds depending on the environment's temperature to lower acoustic noise and energy use. The following table shows ordering information for the thermal kit. 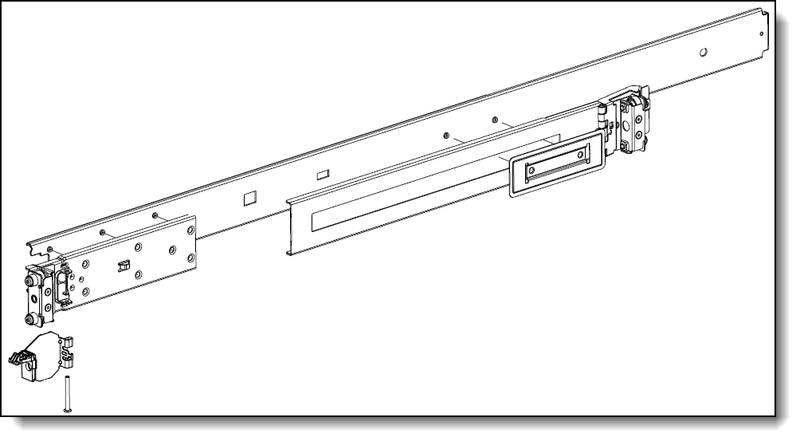 Models of the x3250 M5 server include a static rail kit. No cable management arm is included nor available. The following figure shows one of the friction rails. Maximum weight: 12.3 kg (27.1 lb). Weight (single pack): 12.9 kg (28.4 lb). Server on: 10 °C - 35 °C (50 °F - 95 °F); altitude: 0 - 914 m (3,000 ft). Server on: 10 °C - 32 °C (50 °F - 89.6 °F); altitude: 914 - 2,134 m (7,000 ft). Server off: 10 °C - 43 °C (50 °F - 109.4 °F). Shipment: -40 °C - 60 °C (-40 °F - 140 °F). The x3250 M5 server can be installed in the rack cabinets that are listed in the following table.